Are you ready for one week of PIE?? I am actually sad to inform all of you that I have never really been a pie lover. Neither is my husband. I mean… I’ll eat it if it’s around, but if the choice was up to me I’d go for some brownies or cheesecake. Most of my hesitation probably comes from the fact that I’ve never really made a pie from start to finish. Unless you could busting out a premade crust and canned cherries. The more I thought about that sad baking cheat, the more I decided to accept this as a challenge. I wanted to teach myself how to make pie. Lots and lots of pie. So all of this week I will be featuring a new pie recipe just for you. There will be coconut, banana, apple, pumpkin… and SO many more flavors. 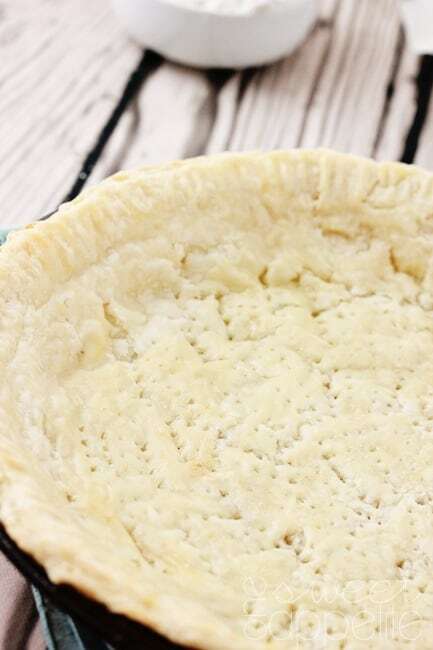 But what’s a pie without a pie crust recipe? This crust = not pretty. However, it is the most amazing, buttery, and flakey crust I’ve come across! AND, it can be pretty if you have lots of patience, which I don’t. So try it out and fall in love with it’s simplicity. Hard to believe that flour and butter can make something so delicious. I strongly suggest investing in a pastry cutter . You can probably get away with using forks, but this cutter is only $5 and well worth it. It takes me maybe 2 minutes to blend in the butter. If you are planning on prebaking your crust, I recommend using an egg wash before you stick it into the oven. That will help give you a nice golden color. Keeping the butter cold and not overworking your dough is really what keeps this crust so amazing. Make sure that if it starts to get too warm you stick it in the fridge for a few minutes. Get ready to put this recipe to good use! Tomorrow’s post is a caramel apple pie that is out of this world amazing! See you soon. 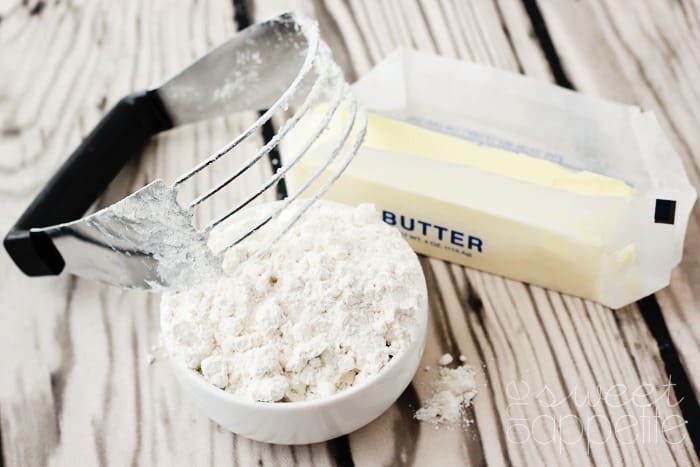 Cut in the butter until your mixture resembles coarse crumbs. Slowly stir in the water until your dough starts to come together. Roll into a 10-12 inch circle and place into your pie pan. Trim the edges and use a fork to give them a nice edge. (more on that coming soon). Use a fork to poke holes along the bottom of your crust to prevent bubbles. Either add filling and bake OR bake before adding the filling for 12 minutes at 350 degrees. This will all depend on the type of pie you are making. I used to make the best pies and I lost my crust recipe. Hopefully I can make a few good ones this year. Thanks for sharing. 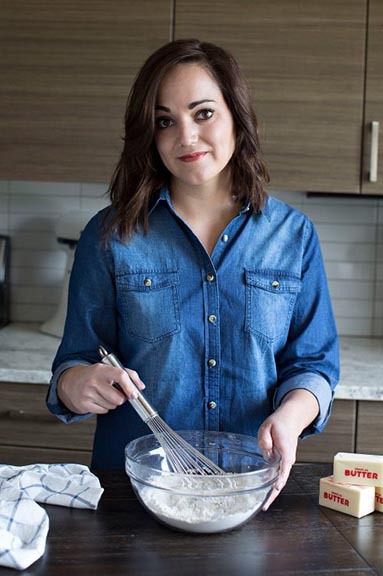 Yum, I have only made pie crust once but it was only okay so I definitely need to try this. Ps I think it would be delicious with pot pie! Yum, and I am a huge fan of creamy pies but not as much the others, except I still eat them when they are available especially for thanksgiving! Aimee, I’m using it in a pot pie next week! I’ve never made a pie crust before. Oddly enough Sean is the pie maker of the family!! I may need to attempt it got a thanksgiving this year though? You should. It’s really not as hard as it seems. Try the caramel apple pie that is up on the site tomorrow. 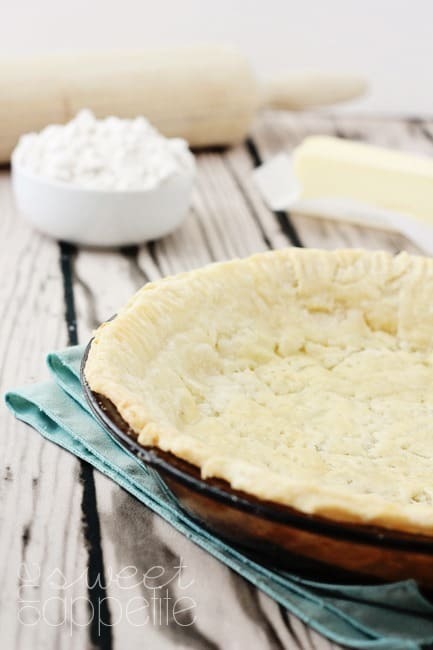 I love a good pie and the pie crust can make or break a pie – I am excited to try out your pie crust recipe. I haven’t made a pin in forever but I have been craving an apple pie. The perfect pie crust is tough. Good job though. This one sounds nice, with all of the butter. I love pie and I actually make it instead of cakes for birthdays in my family. They don’t like cake much. can this crust be made a day in advance and stored in the fridge?